Basic lawn care services or lawn mowing services includes just that mowing your lawn and maybe picking up some a grass clippings after they are finished. If you want more services then you will have to negotiate those services before you sign the contract. A note of caution. Always make sure that everything you are expecting in the way of services is clearly stated in the contract. Otherwise you risk being disappointed. For example if you want grass clippings raked up and also blown off your sidewalk and driveway, this should be specified in the contract. They may provide this service as a matter of course. However there is no reason for them to do so, unless it is specified in the contract. What Lawn Mowing Services are Needed for a Great Looking Lawn? For a lawn to be in great condition during the middle of the summer the lawn needs to be watered on a regular basis at least once per week. 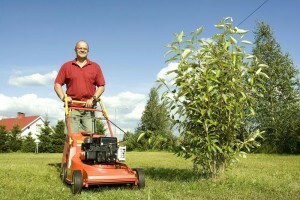 The grass needs to be cut at least once per week and more often if it is fast growing. Weeds need to be pulled and weed control applied as well at least once per month. In addition you may want to have edging completed around the edges of your lawn. Also along your sidewalks, driveway and flowerbeds. Finally there is fertilizer that needs to be added at least four times per year. 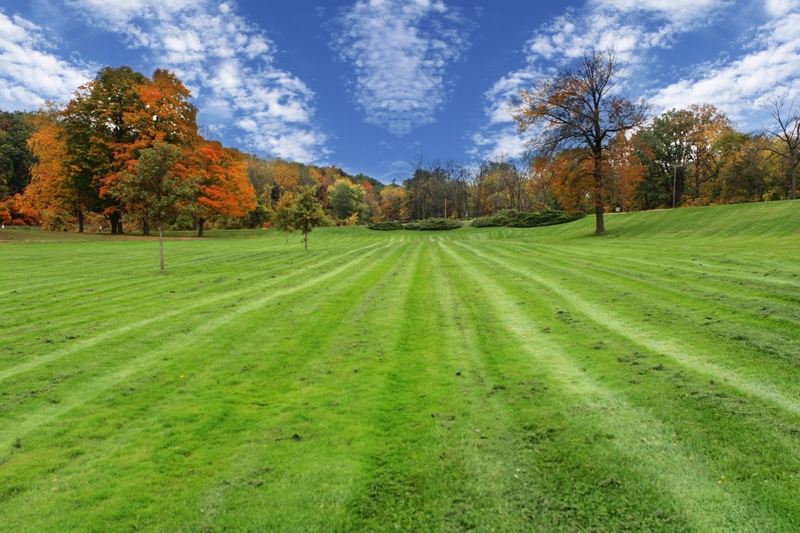 These are the basics of lawn care and will ensure that you have a great looking lawn. Many home owners will have someone look after mowing, edging, and providing fertilizer along with weed care for their lawns. Homeowners will then either do their own watering when needed. Or install an automated watering system. These systems will make sure that your lawn is watered properly based on the climate you live in. There are different grades of fertilizer that can be used. there are also different categories of fertilizers that are aimed at root growth, blade growth and the overall health of the lawn that is being looked after. Your Home Depot and Lowes and other hardware stores can help you select the proper kind of grass fertilizer to apply to your lawn. Make sure you follow the instructions to avoid burning your lawn when you’re applying the fertilizer. A high concentration of fertilizer could actually kill your lawn and cause large brown patches to appear in your lawn if applied incorrectly. Many consumers will hire a local person to do the basic lawn mowing services. Then apply their own weed control and fertilizer along with managing the watering of their lawn. They want to ensure that they have a healthy lawn in their neighborhood. There are also companies that will provide fertilizer services. They will make sure that not only is your lawn fertilized at the proper time. They will also make sure that the right kind of fertilizer is applied for the time of year. For example in the spring, you want fertilizer that promotes strong healthy growth in your grass to make it look green and healthy. In the fall you need fertilizer that promotes strong root growth that prepares your grass for the coming winter. This will help it maintain the overall health of the grass during dormant times and get it ready for the spring. 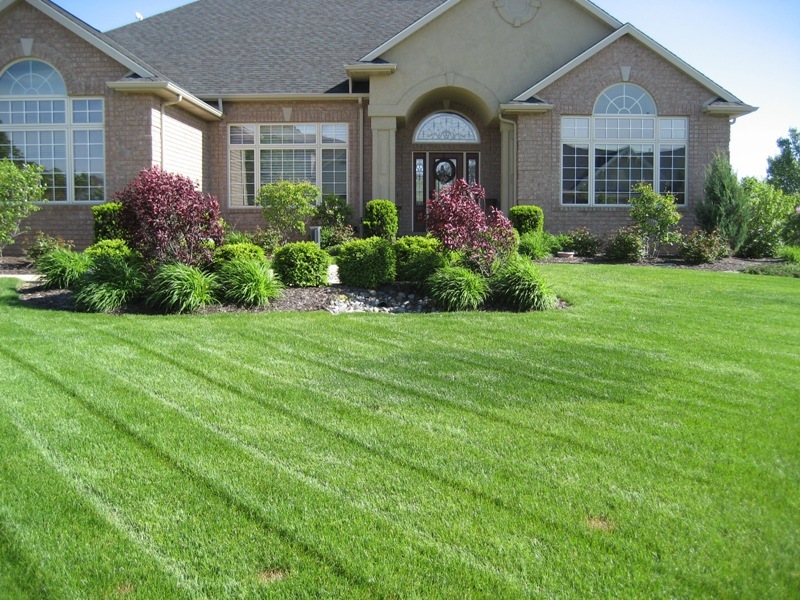 What should you look for when you are looking for professional lawn care services? 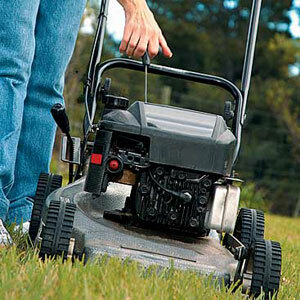 Most people who are looking for lawn care services will either look in the Yellow Pages. Or they will take references from the neighbors and friends who are using a lawn care service. Obsere the company providing lawncare services at a friend’s place. Also the neighbors place or even someone you do not know is probably the best way to find a lawn care service that you like. 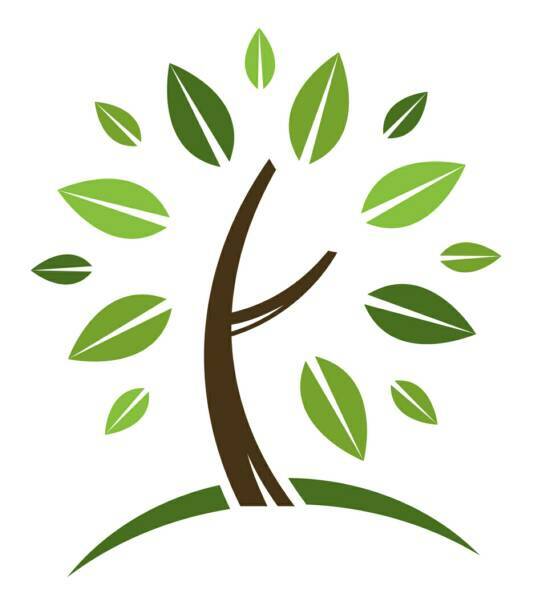 Talking with the customer and finding out what they think of the lawncare service company is one way. It is probably the best way to find a company that is suitable for what you’re looking for. This is a far better approach compared to picking the company out of the Yellow Pages. Compared to signing a contract and waiting to see what kind of service will be provided. Most companies will talk a good line. That’s the sales pitch but the actual service they provide is really what you’re interested in. One more thing, when you talk to other customers, you will need to make sure that you have the same standards. They may not be that concerned about how the lawn looks and just want someone to cut the lawn. This might not be what you are really looking for. Professional lawn care services should include mowing the grass, picking up any grass clippings that are left on the lawn, cleaning grass clippings from your sidewalks and driveway after the morning is completed, and edging your grass along flowerbeds and driveways etc. This is the minimum that should be included in the contract. You may also want to include fertilizer and weed control at appropriate times during the year. This will ensure that you have a great looking lawn at all times during the year. In addition you may also want to have various services such as dethacthing of your lawn every couple of years and also aeration of your lawn if required. All companies that provide lawn care services will try to up sell you on various services in addition to the basic professional lawn care services that they provide. Some of these services may be interesting to you while others may not. There is no harm in listening and then declining these extra services, however consumers can also negotiate package deals for the basic services as well as these extra services. Whatever you do, avoid succumbing to the sales pressure and taking more services than you actually want. They are just doing their job to try to sell more and bring more business into the company. Part of ensuring that your lawn has that professional looked after look is to purchase the right services for lawn care. Your lawn needs to be mowed at least once per week. Grass clippings removed and your lawn edged at the same time. Weed treatment should be applied as needed with fertilizer added at least four times a year. Seasonal fertilizers should be used to ensure that root growth and blade growth are optimized. We also suggest that grass seed be added to the lawn once a year usually in the spring to thicken it up. Make sure that you also cover the seeds lightly with top soil. Does it really matter whether a lawn car company is local vs. national in scope? The larger companies have more advertising budget which means that you the customer are probably paying for that advertising. We happen to think that if you can find a reliable local lawn car company or even individual, your prices for lawn care will be lower in the long run and your lawn will look just as great. It really comes down to how great your lawn looks after paying for a service. Even if the price is a little bit higher in one case, many people would be more than satisfied if they had a golf green lawn to show off to all of their neighbors. Regardless of what company you go with, it all comes down to results, services and price. We decided to list a few of the services and issues that consumers should really pay attention to if they want a great looking lawn. What Does your Lawn Need to Look Great? The basics of lawn care are the following: regular cutting so that it does not get too long, nor to short; frequent watering so that your grass has water to grow; regular fertilizer at least 4 times a year with the right mix of fertilizer for the time of year; regular weed treatment to keep the weeds at bay; thickening of the lawn with grass seed; dethatching every couple of years to get rid of dead grass; and trimming to keep the edges of the lawn looking great. Some of this work can be done by the consumer, in fact it all can be completed by the consumer, however it is more about how much you want to do vs. how much you would like to give to a contractor to look after. If you do decide to hire a national lawn care company or a local lawn care company, make sure that you have a contract that spells out exactly the services that you will be asking them to provide vs. what you will do yourself. Watering your lawn is usually completed by the homeowner with cutting, trimming, fertilizer and weed applications either completed by the home owner or the lawn care company. Spell it out on the contract and get the best price you can for the service that you are taking. If you decide to ask for quotes from several companies, make sure that these companies are quoting the same services so that you can do a valid comparison. If the services are different along with the price, it is more difficult to make a decision based on a comparison. Warranties are pretty basic. There are just too many variables with weather, bugs and weeds for lawn care companies to provide a warranty. They can guarantee that their work will be consistent and completed as per the contract, that they will not harm your lawn and that is about it. Price is always an issue and often you get what you pay for. Ask for references and talk to the references about the service levels and the satisfaction levels. Ask what they are happy with and what they are unhappy with. There is a lot to consider, but then again it is only for a season and then you can move onto another national lawn care company or do the work yourself. If you’re starting at lawn care business you will need insurance to cover yourself, your equipment, damage that you might cause to customers property and your employees. If you decide to run the business just by using your own personal labor evaluate the risks. Not hiring anyone else reduces the risk of not having any kind of insurance coverage. However if you cause some damage to someone’s property there’s a good chance you’ll have to pay for it. If you are not incorporated, you also put your personal assets at risk as well. The insurance that you will need to consider will include liability insurance, disability insurance, optional equipment insurance and healthcare insurance. Healthcare is required for your employees in case they get hurt or injured on the job. All of this insurance can be expensive. Some serious decisions must be made regarding how you will proceed with your business. It basically must generate enough cash to pay for all of this increased expense. The amount that your insurance is going to cost will be substantial. You will have to generate sufficient business to pay for the insurance. This is in addition to all of your other expenses. The first step is to get several quotes and go through the details very carefully to make sure that the quotes are providing you with the same kind of insurance. You then want to evaluate the risk that you’re taking of not having insurance and also how much the deductible will be if you decide to take a higher deductible to lower your overall insurance costs. 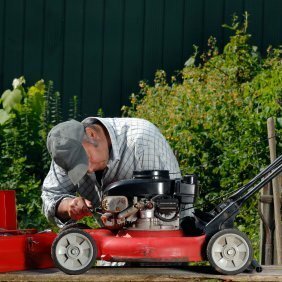 In addition to deductibles, equipment items such as lawn mowers and other miscellaneous equipment should really be excluded since the replacement cost will likely be below your deductible. Major items such as trucks and trailers will already have insurance just to get them on the road. If you have major pieces of equipment such as tractors and other equipment, you must decide if it is worth having insurance on these items vs. self insuring them. Liability insurance is probably the single largest item and most important. This insurance would cover any damages that you might cause to a clients property. Again the larger the deductible, the lower your payments for insurance are going to be. Basic decisions here will determine your overall costs of the insurance and also prevent your company from going bankrupt by a claim against your company for damages. Consider Healthcare costs. Finding and paying for a reasonably price healthcare package is pretty difficult. Many business owners will hire employees with no benefits provided. However there is still is your family and your own personal coverage to consider. You may decide to funnel your own health care benefit through your company. Charge it as an expense. Write this expense off against your income. Check with an accountant before proceeding with this step. This is an important business decision that you must consider to protect yourself and your business. If you’re not incorporated also your home and family. Give it some thought and discuss the issue with your colleagues and partners in your business. 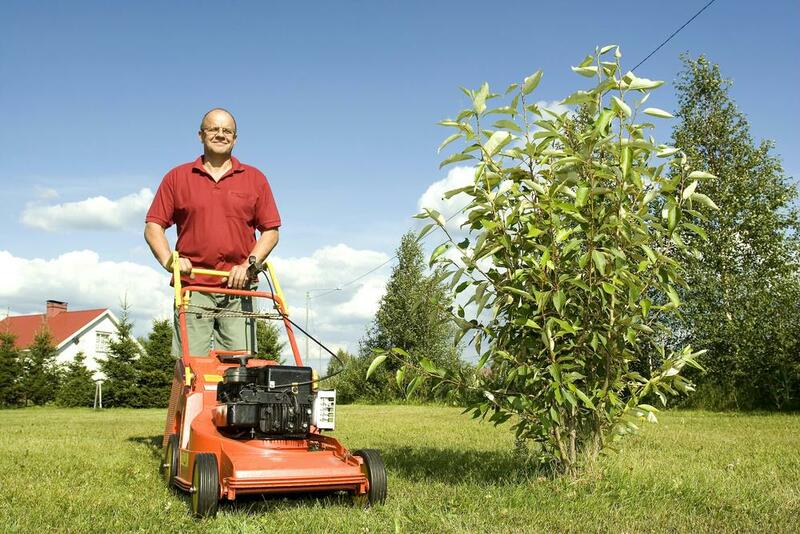 Do you need lawn care business insurance? Bottom line is how much is at risk for you personally and for your company if you are in the lawn care business. What happens if you leave a gate open or damage some property? Can you afford the lawsuit out of your own pocket? For most businesses and individuals, probably not. A lawsuit can sink your company and possibly your personal possessions as well unless you have some kind of business insurance coverage. A friend of mine operates a small lawn care business more as a hobby, a chance to get some exercise and to make a little money. He is retired and this gives him something to do outside which he loves. He has seven customers and he uses his own car to move his lawnmower, rake, edger etc from one customer to another. There is no lawn care business insurance or any liability insurance. He cannot afford it on what he makes and is extremely careful. I have not seen his contract, however he probably has all of the disclaimers etc in it. He is operating his business, actually he is not even incorporated. If he is sued by one of his customers he risks losing a great deal, however this is a minimal risk he is willing to take. There are no pools to worry about and he is a very careful man. He also does not have any employees which makes everything much simpler as well. I asked him about insurance one day knowing that he did not carry any insurance. He indicated that he makes sure that is very careful with everything he does and he does have disclaimers in his contracts. He is also prepared to make repairs etc if needed. Another example is for a business with multiple trucks, with trailers and lots of equipment with several employees. He has many customers and there really is no question that he must carry lawn care business insurance to cover his customers, his employees and himself. He is also incorporated and has made sure that his personal possessions are not at risk should something happen. It is very obvious that he needs to have lawn care business insurance to cover his situation. The difficulty is where do you draw the line and decide that you need to have insurance. For the writer it occurs when you begin having employees who may or may not be as careful as you are. They may damage something and you will need to replace or repair whatever it is. It may not even be something you want to put through your insurance, but at least you have it in case it is needed. Another decision is how much insurance to have and what the deductible will be. If for example you are willing to take on some of the risk e/g $10,000 deductible, then your insurance costs will be lower than someone who has a $5000 deductible for example insurance policy. We are thinking about hiring a lawn care company and wondering how to go about finding the best lawn care company? This web site is primarily about lawn mowers, the types, repairs and maintenance and lately we have branched out to look at how to maintain lawns and keep them looking golf green ready all year long. So what would be more natural than to look at how to find the best lawn care company. There are several lawn companies operating in our area and we have used several in the past to spread fertilizer on the lawn, and spread weed control material on the lawn, but not to really look after our lawn in a serious way. We were actually not that satisfied with their services. This may seem like a lot and we are not sure that we actually want all of these services, but we thought we would start with this list and see what kind of responses we get to each item along with the prices quoted. Personalized service is a big item with us. We want the same guy looking after our lawn all of the time so that he or she gets to know our lawn and will take great care or better care of the lawn vs random people showing up to cut the lawn. We also have a grub problem and a small weed problem. Turns out that the grubs will emerge soon as the adults and then the adults will lay eggs. We cannot put any grub control on the lawn until the middle of July, since it really will not work on them until them. The grubs will emerge in July and grow over the summer and fall. We are planning to spray the lawn as soon as we can to control the grubs and the weeds. This is something that I would really like to a lawn care company to take control of. The grubs live on the roots of the grass. In dry periods your grass dies because there are no roots to absorb any moisture that is left in the ground. In addition raccoons can smell the grubs . They in turn dig in your lawn and root up the grass leaving ugly patches of grass that will also die. You can easily lose your lawn if you are not careful. We are going to apply grub killer this year and hope for the best. We have the liquid kind. Apparently you should apply this in the rain so that it is absorbed by the ground. It should get deep enough to kill the grubs. It seems to work since we have applied this now for two years and no more problems with raccoons digging up our lawn. Let us know what you think about these requirements and if there is anything else that we should be considering when hiring the best lawn care company.